There are an estimated 44,000 of them in the Solar System. And no it's not a mythological creature that is half human half horse. Although they were named after those creatures. A centaur in space is an object that is a mix of an asteroid and a comet. The general definition is, an object that lies between Jupiter and Neptune, that crosses the orbit of one or more giant planets. They have unstable orbits, and will change location within the Solar System over time. Because of this, a centaur is likely to collide with a major planet, get pulled in by the Sun, or get expelled out of the Solar System. If a centaur gets close enough to the Sun, it will get a tail like a comet. As that happens, they may be reclassified as a comet. Centaurs come in different colors. For the most part, they are classified into two color classes, very red and blue. Color differences suggest different composition and origins. 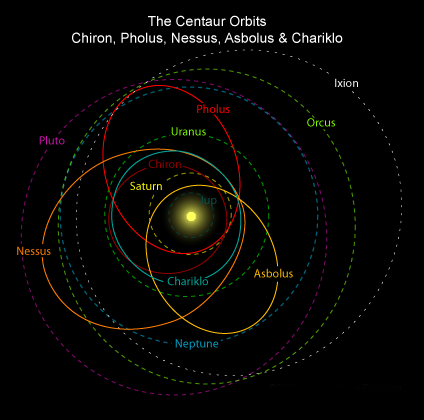 Essentially, centaurs are rocks of the Solar System, just like asteroids and comets. There are a myriad of rocks between every major planet, suggesting our Solar System has had one or more major turbulent events in its past.